Over a century before the founders of Fargo’s early settlement sowed the seeds of the town’s businesses and commercial districts, the United States Congress adopted the Land Ordinance of 1785. That action on May 20 on May 20th made way to generate federal income via the sale of land in the unmapped territory west of the original states acquired at the 1783 Treaty of Paris following the American Revolution. 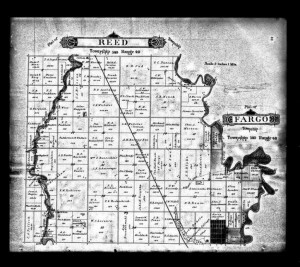 More importantly, the Land Ordinance of 1785 established the Public Land Survey System that Fargo’s first surveyors used. This surveying model dictated the physical layout for the various residential, industrial, and commercial interests west of the Red River. The Dakota Territories, along with over three-fourths of land within the continental United States, came under the system’s rectangular survey, where surveyors systematically divided land into square townships of six miles on a side. According to the Public Land Survey System and rectangular survey, each township was then sub-divided into thirty-six sections of one square mile or 640 acres. 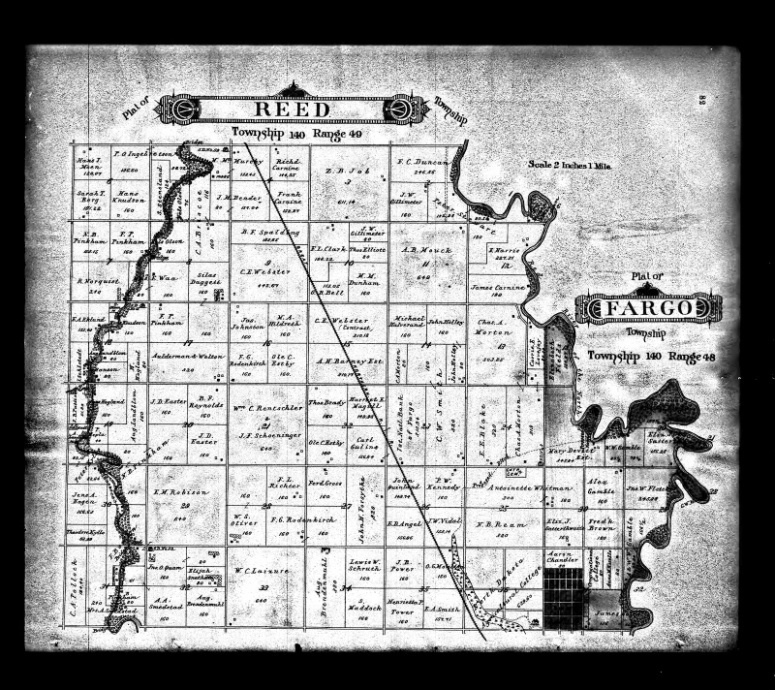 Sections could then be further subdivided for resale by settlers and land speculators, and this is reflected in Fargo’s first land ownership maps of the 1870s. The system not only enabled surveyors to quickly and efficiently map out vast territories, but also portioned the land up, making organized and accessible for settlement and purchase. Although land policy changed with the introduction of the Homestead Act in 1862, the early land ownership maps signal the influence of the Land Ordinance of 1785 in the planning and early development of Fargo’s presence on the Plains in 1872 as well as the names of some of the area’s eventual business and commercial proprietors.